The Comptroller and Auditor General of India is the guardian of the public purse. 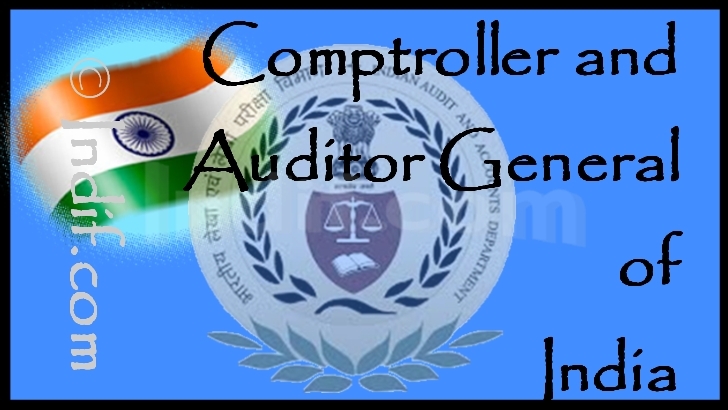 The Comptroller and Auditor General of India (भारत के नियंत्रक-महालेखा परीक्षक) is an authority, established by the Constitution of India under article 148. He is appointed by the President. The Comptroller and Auditor General of India, as the head of the Indian Audit and Accounts Department, is thus neither a part of the Legislature nor the Executive but is an officer created by the Constitution to see that diverse authorities act in regard to all financial matters in accordance with the Constitution and the laws and rules framed there under. The Comptroller and Auditor General of India is ranked 9th and enjoys the same status as a judge of Supreme Court of India in Indian order of precedence. The Comptroller and Auditor General of India hold office for a term of six years from the date on which he assumes such office, provided that where he attains the age of 65 years before the expiry of the said term of six years. He shall not be eligible for further office under the Government of India or of any State after retirement. He can be removed from office only on grounds of proven misbehavior or incapacity after an address by both the Houses of Parliament supported by a two thirds majority. His administrative powers and the conditions of service of persons serving in the Indian Audit and Accounts Department shall be prescribed by rules made by the President only after consulting him. All the Union and State Government departments, including departmental commercial undertakings such as the Indian Railways, Posts and Telecommunications. Public commercial enterprises controlled by the Union and the State Governments- ie. Government companies and corporations. Non-commercial autonomous bodies and authorities owned or controlled by the Union or the States. Authorities and bodies substantially financed from Union or State Revenues. Any authority or body, not being a foreign state or international organisation, which get any grant or loan for any specific purpose from the Consolidated Fund of India or of any State or any Union territory having a Legislative Assembly. •Audit of all receipts which are payable into the Consolidated Fund of India and each of State and each of Union territory having a Legislative Assembly. Audit of the Regulatory bodies such as Telecom Regulatory Authority of India (TRAI), Central Electricity Regulatory Commission (CERC), State Electricity Regulatory Commissions (SERCs) and Insurance Regulatory Authority and Development Authority. However, role of audit of the Regulatory Authorities are at present confined only to the extent of certifications of their accounts as audit scrutiny over regulatory functions is still somewhat nebulous. Companies where the equity participation by Government is 51 per cent or more.